Iraq have been eliminated from the 2017 FIFA U-17 World Cup following a Round of 16 defeat against 2015 finalists Mali. The Cubs of Mesopotamia could not keep up with the physicality of the African outfit, who comfortably won the match 5-1. The first half saw end-to-end action with both teams creating chances, however the Iraqis efforts were futile. 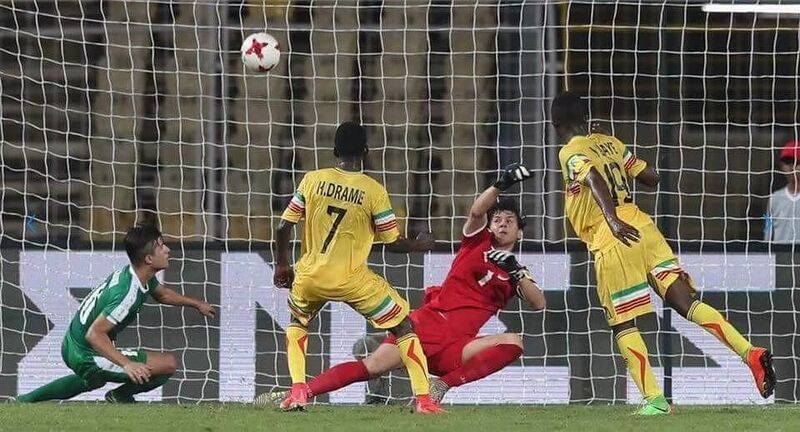 In contrast, the Malian side was very effective, scoring the first goal in the 25th minute by Hadji Drame, after great play from the left-hand side. Striker Lassana N’Diaye doubled the advantage with a diving header after the half-hour mark. The second half saw Iraq try to get back into the game, but the Malian defence was resilient and managed to control the tempo of the match. The former African champion scored a third through a fantastic strike by Fode Konate. Our youngsters still tried to get back into the game and were rewarded in the 85th minute when Ali Kareem scored to make it 3-1. However, the team lost focus and Seme Camara capitalised by scoring in the 87th minute and assisting another in the final moments of the game. Iraq clearly missed striker Mohammed Dawood, who was suspended for this match; the team was toothless in attack and his absence was noticeable on the team. Despite the defeat, this marks Iraq’s best ever participation in the U-17 World Cup – a huge improvement on Iraq’s previous participation where they finished bottom of the group without a single point in 2013. To relive our group stage run that saw us finish ahead of Mexico and Chile, read our previous article here.